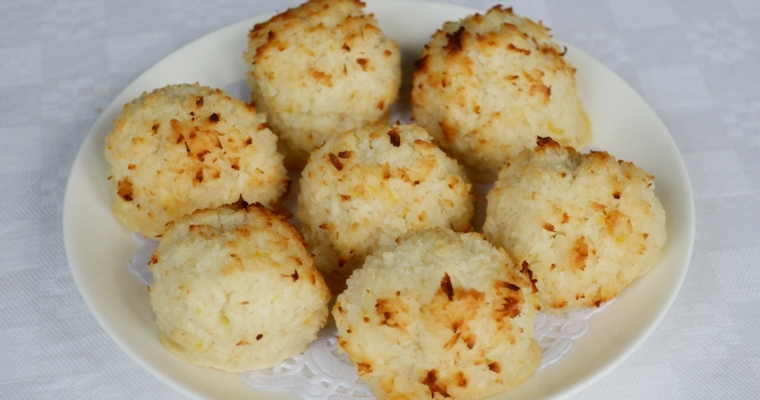 Coconut macaroons should be moist and chewy, with just a hint of sweetness. Connoisseurs insist they should be made with shredded coconut, rather than desiccated coconut, as this results in a moister baking product. This is because more liquid is extracted from desiccated coconut during processing, and it is ground more finely into grains rather than thin strips. However, shredded coconut is difficult to find in the UK. An easier and cheaper solution is simply to add back in the moisture. Dried coconut can be re-hydrated without compromising on flavour by using warm coconut milk to plump up the grains. This wetter mix is held together using eggs. Only the egg whites are used, as this is the part of the egg that contains the binding proteins. This results in an airier texture, as the egg yolks contain all the fat and ‘eggy’ flavour. Preheat the oven to 150°C/300°F. Line a baking tray with baking paper. Pour the coconut milk into a small saucepan. Heat over a high heat to just below boiling point, then turn off the heat. Tip in the desiccated coconut, and stir to coat evenly in the milk. Cover with a lid and leave undisturbed for 20 minutes, allowing the coconut to absorb the liquid. Scrape the coconut mixture into a mixing bowl. Add the remaining ingredients except for the egg whites (honey, lemon zest, lemon juice and salt), and mix until fully blended. Lighten the coconut mixture by stirring in half of the whisked egg whites. Tip in the rest of the egg whites and gently fold in using a spatula: cut down the centre with the side edge of the spatula; scrape across the bottom of the bowl and up the side, scooping up the mixture as you go so that it is turned over and under; rotate the bowl 90° and repeat until fully blended. Be careful not to overwork the mixture and knock out the air, but make sure the bitter egg white is fully blended. Wet your hands, then very loosely shape the mixture into 12 balls. Resist the temptation to roll between your palms to create perfectly spherical balls, as this will compact the mixture and make dense macaroons. Arrange on the lined baking tray. Leave some space between each ball, as this will help form a nice crust. Transfer to the preheated oven and bake for 15-20 minutes, until lightly golden. Turn the tray halfway through for even colouring. Wait until the macaroons have cooled for 10 minutes before transferring onto a wire cooling rack using a palette knife or fish slice. They will be slightly gooey until fully cooled and set. Once cooled, transfer to an airtight container and store at room temperature, where they will keep for 1 week.